The makers of mass action entertainers specialist Boyapati Sreenu’s upcoming film will be unveiling the film’s title at 2:45 pm today. Meanwhile, we have exclusively ​learnt from our sources​ that the film has been titled Jaya Janaki Nayaka. 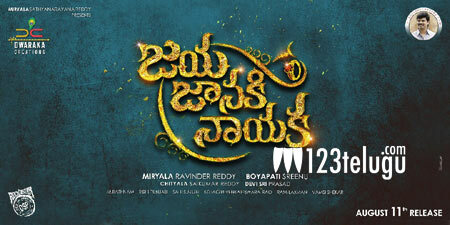 Jaya Janaki Nayaka is a romantic action entertainer in typical Boyapati’s style. The film will be hitting the screens on August 11. JJN stars young hero Bellamkonda Sai, Rakul​ Preet and Pragya Jaiswal as the main leads. DSP is the muisc composer and Miryala Ravinder Reddy has produced the movie.